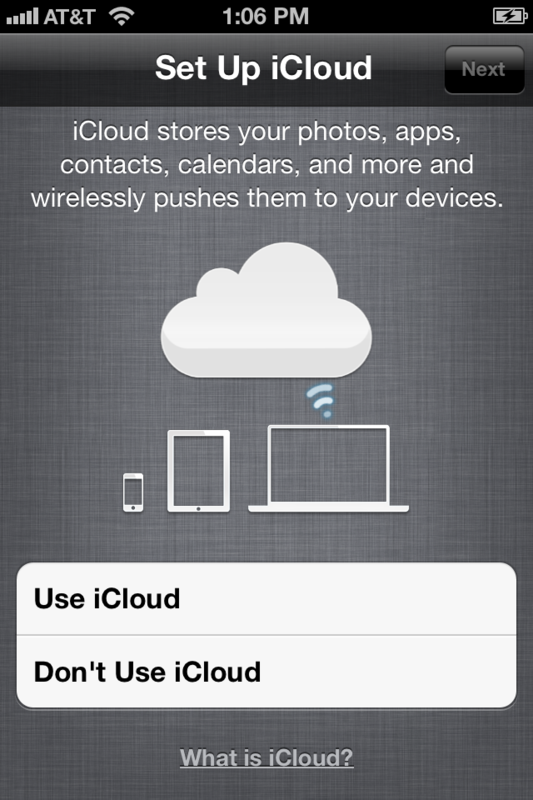 iCloud debuted Tuesday for all iOS 5.0 devices. On Friday, the iPhone 4S was released. You’d think that would be a banner week for us. However, there is disharmony afoot in our Apple-land. In 2001, iTunes was released. I quickly setup an iTunes account using my personal email address. In 2002, .Mac was released. I quickly setup an account with a free email @mac.com. In 2008, .Mac was renamed to MobileMe and my @mac.com account got a new domain and I now also had an @me.com address. For 10 years, that hasn’t caused me a problem. I have purchased an amazing amount of content via iTunes: Music, Videos, Television Programs, Movies, Applications, and most recently, Books. I have synchronized all of my Contacts, Calendars, Notes, Mail Accounts, Bookmarks, Preferences, Keychains, and enabled “Find My iPhone” using my .Mac (later MobileMe) account. I upgraded my MobileMe account to a Family Pack and included my wife, mother, father, and our au pair so they could reap the benefits of device synchronization. My wife and I converged our iTunes accounts (basically re-buying everything she had purchased in her account) and we now both purchase and use the same account so we both can use the same content. I’m guessing most families do this. When you first open your iPhone after installing iOS 5.0, you’ll see a screen like this, you’ll want to use iCloud. So, how do you do that? Easy really, this is Apple. Trust the iOS. When you see this panel, just sign it with your MobileMe account. If you don’t have a previous MobileMe account, then create a new one on this panel and sign it with that. Forget your iTunes account for the moment. 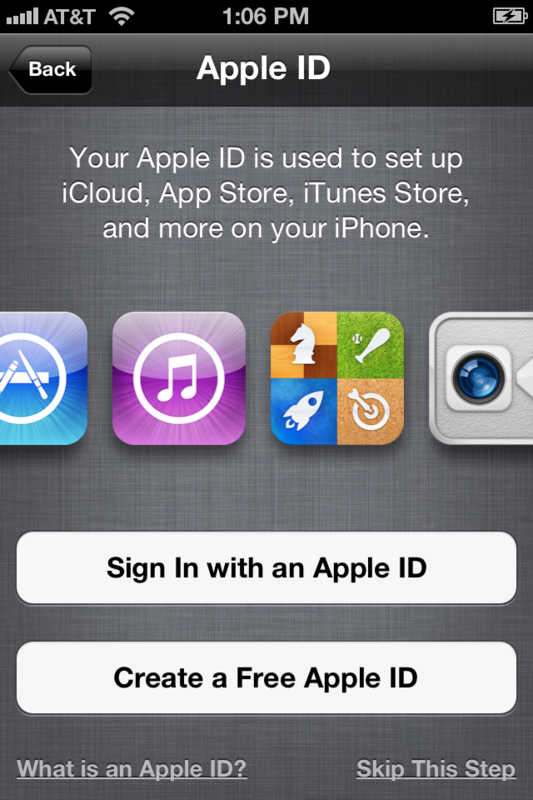 When you’ve completed the setup, you’ll have an iCloud account (providing you also did the conversion to iCloud from the MobileMe website). That account will control all of your personal data and keep it synchronized with all other iOS devices or OSX computers where you’ve enabled that same iCloud account. If you restored your iPhone from a previous backup, then you’ll find your iTunes account is already setup and working. Apple maintained that setting, separate from the iCloud account. So, you can still share all of your iTunes purchased content with your family using that ID. To verify that setting, go to Settings -> Store and verify the Apple ID at the bottom of the screen is your shared iTunes account. If it’s not, you can tap it, Sign Out, and sign in with the correct one. 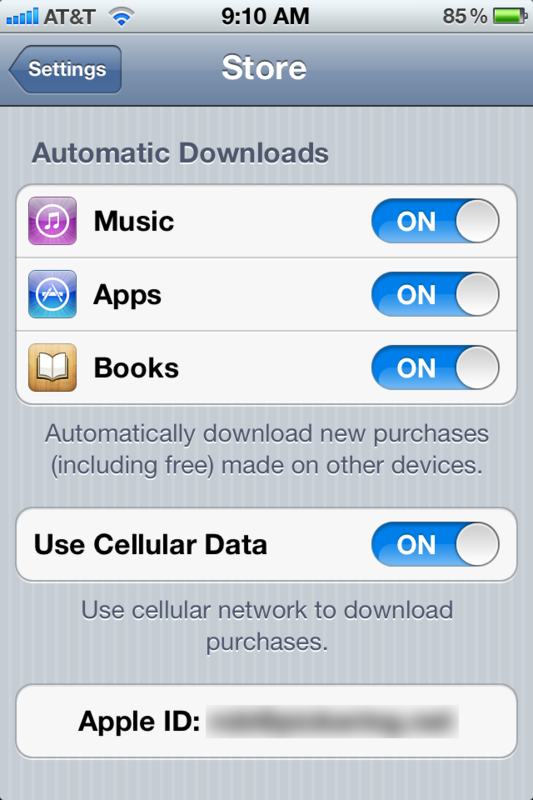 You’ll then want to set Automatic Downloads for Music, Apps, and Books to match your preferences. If you have them enabled, then any of that content purchased with your iTunes account will be automatically downloaded to the device. Finally, you will probably want to setup / check the settings for Messages and FaceTime (both should probably be your iCloud ID) and Music -> Home Sharing (your shared iTunes account). You will now be in Apple synchronization and iCloud heaven.